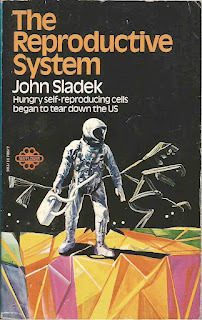 Quick flick reveals: I very rarely bother acquiring science fiction for the Lost Book Library, for the simple reason that it's magnificently hard for a sci-fi novel of any interest to stay lost. The sci-fi community is just too good at keeping books in circulation in some way or other and for awareness of them to stay constant. I thought I'd struck pay-dirt with The Reproductive System, however. It had the 'aura' of a lost book when I saw it, and indeed, it pretty much had been lost for several decades. Turns out, however, that it was rescued from obscurity and reprinted a while back. Still, I paid my money, so here it is. It looks like the sort of sci-fi that I find appealing. An artificial system that gets out of control, and infects humanity like a virus. Predicts the logic of early David Cronenberg, only with boxes instead of vaginal mouths. (Is there an early Cronenberg film with vaginal mouth openings in peoples' flesh? I feel there ought to be.) Anyway, I look forward to reading it.